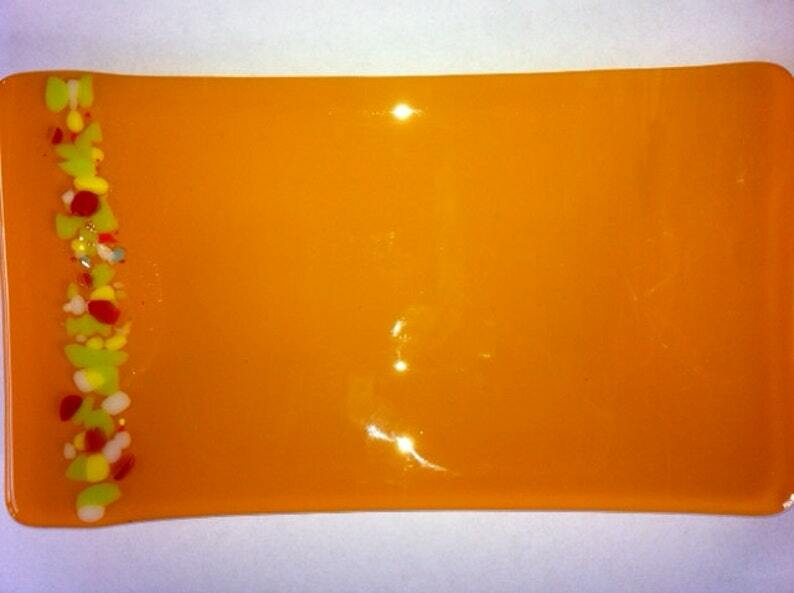 This eye-catching sushi dish is made from a bright orange glass accented with small pieces of frit glass along one edge. It measures approximately 9 inches long, 5 inches wide and 1 inch raised at the edges (23 x 13 x 2.5cm). It is VERY sturdy and versatile (if you were here right now, I'd be banging it on the table to show you how sturdy) and can be admired empty or used to hold sushi, candles, junk mail, keys, snacks, dip, jewelry, or whatever else you can think of! The glass used is lead free, food safe , dishwasher safe and incredibly durable. This unique dish was created in my studio over a 3 day process- designing, cutting and layering the glass, followed by 14 hours in the kiln to fuse the glass into a single sheet, and finally another 14 hours of slumping the glass into the curved sushi dish shape. This dish is extremely durable and should provide you MANY years of enjoyment (even more if you don't use it in the microwave or dishwasher)! While the dish is dishwasher safe, I recommend hand-washing. I am happy to do custom orders, so if you see something you like but would prefer a different color or an entirely new custom order, please convo me. Thanks for looking! So easy to work with, gorgeous work, thank you so much!